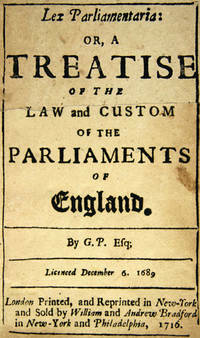 Publisher: New York: William and Andrew Bradford, 1716. EEBO Editions, ProQuest, 2011-01-03. Paperback. Good. Book on Demand Ltd.. PAPERBACK. 5518774591 Special order direct from the distributor . New. 2011-01-03. New. Ships with Tracking Number! INTERNATIONAL WORLDWIDE Shipping available. Buy with confidence, excellent customer service! Frederick, MD: Jacob D. Dietrick. Good with no dust jacket. 1806. Hardcover. Full calf; First two leaves gone, small hole on lower title page, light foxing throughout, bits of leather gone from spine ends, corner gone from spine label, leather cracked down front hinge fold, rubs and scuffs . Dallas: Carrington. Fine with no dust jacket. 1979. First Edition. Hardcover. Limited Edition - # 12 of 75 copies, SIGNED and inscribed by author; Quarto . Bloomington, IN: Principia Press, 1932. Near Fine, top edge dusty, cloth very lightly rubbed, contents are clean, tight, and unmarked. 568 pages. SCARCE in the First Edition and in such lovely condition. . First Edition. Cloth. Near Fine/No Jacket, As Issued. Lappiske Rettsstudier [Lappische Rechtsstudien]. Instituttet vor Sammenlignende Kulturforsking, Serie A, XXIV.